Backpack manufacturers seek to find a balance between durability and weight. Most Indian trekkers prefer durability over shaving weight, and the trekking gear that is available in India reflects this attitude. Manufacturers e.g. wildcraft seldom list the item weight on their product page, because weight is usually not an important consideration for most buyers. Yet, we at inditramp are always looking at ways to shave weight from our packs. We feel that a lighter weight equates to a faster speed and thus a much safer trek. Also, we tend to enjoy nature more if we are less bogged down by the weight on our backs. Therefore, when Decathlon launched the lightweight "Speed" backpack, we jumped at the chance to see if its any good. 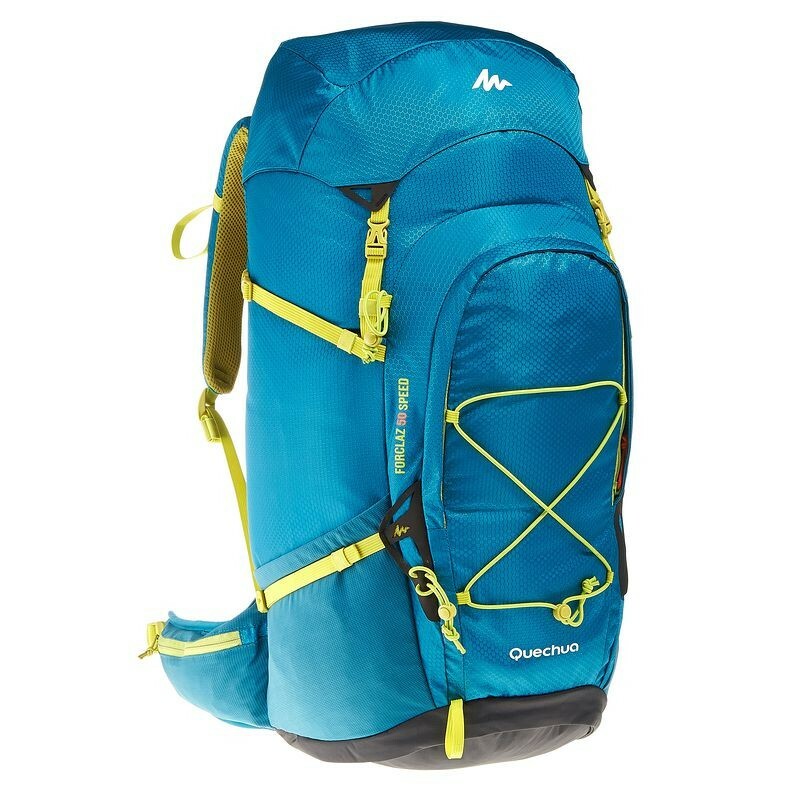 Decathlon markets the Quechua Forclaz Speed 50 as a lightweight backpack designed for a hiker who doesn't mind losing padding for reduced weight. The description is spot on because the Forclaz Speed 50 tips the scales at just over a kilo (1080 grams). To put this weight is perspective; most 50 litre backpacks available in India weigh between 1700 grams and 2200 grams. For example, Decathlon's other 50 litre backpack, the Forclaz Easyfit weighs in at 1750 grams and the Trailblazer 50 litres backpack from Wildcraft weighs in at 1700 grams. So what do we get and lose for this significantly reduced backpack weight? We tested this pack for seven months on over 30 treks in the Indian Himalayas. We trekked with this backpack in autumn and winter over elevations between 2000 and 4400 meters. The weather conditions were cold and the terrain was rock, snow and ice. The lowest temperature recorded on these treks was -11 degrees C and the highest elevation achieved was 4392 metres. The aluminium hollow pipe skeleton helps the backpack retain its shape and it is removable. The non removable foam back panel is ribbed and enclosed in mesh for better ventilation. The aluminium frame and the contoured back panel ensures the backpack sits snug against the back. Even on difficult climbs such as the winter ascent to Indrahar pass we did not feel any weight shift in our backpack. However, we noticed that on a humid day the ventilation was inadequate and our back was sweat drenched after a few hours on the trail. Backpack frames can be broadly classified in three categories: a) A full contact back b) full ventilation and c) adjustable system. A full contact back allows the pack to sit close to the body, therefore load is carried closer to the users' centre of gravity. Backpacks with full contact backs are ideally suited for mountain sports that are extremely motion intensive such as mountaineering, climbing and ski touring. Pros: Freedom of movement Cons: Less ventilation on the back. Manufacturers use airflow tunnels and ribbed designs to help improve ventilation on a full contact back. The Forclaz Speed 50 backpack has no fancy adjustable suspension. The suspension is fixed as the shoulder straps are stitched straight to the backpack frame. This lack of adjustable suspension is a conscious design decision to help keep the backpack weight down. Packs offer either adjustable or fixed suspension. 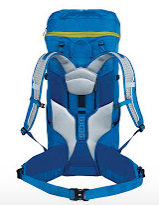 Adjustable suspension allows you to fine-tune the fit of your pack to match your torso size. Many feature a ladder-type system of rip-and-stick closure that let you move the shoulder harness up or down in small increments. With a fixed suspension backpack the flexibility to match your torso size is minimal. Therefore, it is a good idea to load a fixed suspension backpack with real life trekking gear and try it on for a while, before the purchase. This "try before you buy" is the reason we prefer to visit physical Decathlon stores. We reckon that the Forclaz 50 speed will fit most Indian males, 165 to 175 cm tall. However, we do recommend visiting a physical outdoor gear shop for a trial before purchasing it. The shoulder straps are thin yet well padded. They sit comfortably for long hours despite their deceptively thin profile. We tested our backpack with progressively heavier loads and found that with over 18 kilograms the shoulder and hip straps started to dig in uncomfortably after a few hours. The sweet spot for this backpack is a total weight of under 15 kilograms. The shoulder straps are length adjustable via plastic buckles. The shoulder straps contain two daisy chain loops, which is a neat touch. These loops may be used to string along frequently used items such as a camera or a compass. The vertically adjustable sternum also sits on the shoulder strap. The strap is stiff and does not shift on the move. The pack also comes with a non removable, lightly padded hip belt. 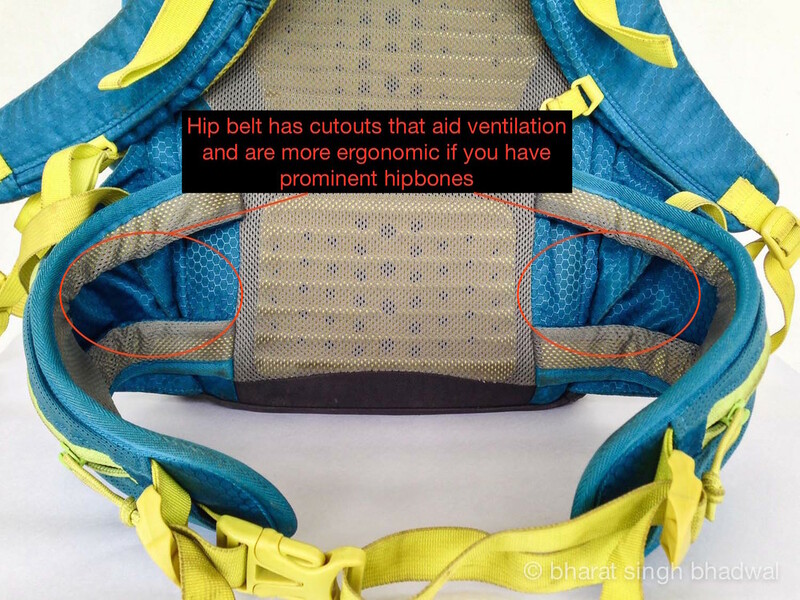 Although the hip belt exerts no pressure points, we would have preferred a more substantial padding along the hip belt. The hip belt features a small zippered pocket on both sides. These pockets are tiny and even pocketing a small device like a Garmin Etrex 20 GPS is a tough ordeal. A stretchier mesh fabric, could have made these pockets more usable and given the user, better access to frequently used items. The hip belt has slits cut off in the centre and it is an excellent design touch. The cut off aids ventilation and ensures a better fit for those with prominent hip bones. Cutouts on hip belt. Nifty. 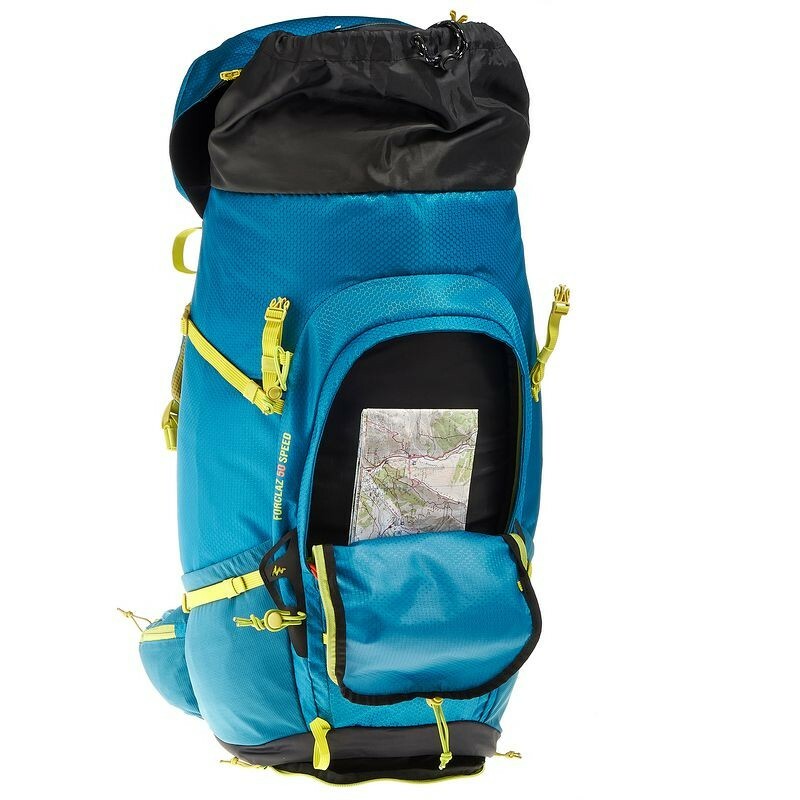 To keep the weight down, the Quechua's Forclaz Speed 50 is one big pocket with minimal organisation. The pack has no separate sleeping bag compartment or a rain cover and we don't miss either of these features because we seldom use them. The backpack has two access points; one at the top and another at the bottom. Frankly, we feel that the bottom access is a potential point of failure. We would rather suffer the inconvenience of having one access point than deal with a bottom access zipper failure in the middle of a trek. The bag has four zippered pockets and two mesh sleeves. Since the hip belt pockets have little or no practical utility, we are left with two pockets; one on the front and another on the top. A small detail that we really miss in the zippered pockets is a car key hook. It is a convenience that gives us peace of mind and we appreciate having it. The mesh sleeves along the sides seem to have been put together as an afterthought. None of them are not tall enough to hold a litre bottle and their elastic opening is not strong enough to keep a filled bottle from tipping over. This means water bottles in the mesh sleeves have to be cinched down with the compression straps to avoid them from falling out. Falling bottles can be dangerous and frustrating over a steep climb where retrieving a fallen bottle is usually not an option. The backpack has a trekking pole / ice pick loop at the front. Two flexible cords support the loop and help lock the poles or ice pick in place. In practice this works well. Do keep in mind that you will have to pack down your trekking poles to their smallest size before strapping them in. Trekking poles / ice axe loops with the correct way to cinch down an ice pick. Decathlon's web site does not indicate the fabric used for this backpack's construction other than it is a polyester and polyamide fabric. The fabric used has honeycomb pattern that gives it some rip stop ability. This honeycomb pattern also adds texture to the backpack and prevents it from slipping. The backpack's bottom is made of a fabric than is tougher than the one used for the body. The stitching is top notch throughout and all potentially vulnerable areas are ruggedised with adequate cross stitching. Another feature that we like is the use of rubber inserts for the lower compression straps and the bag top. These rubber inserts help prevent fraying without adding weight. All zippers on this bag are YKK and come with pull stops made from an elastic cord. These pull stops allow these zippers to be operated with winter gloves. If we had to nitpick then we would want to improve the stitching that connects the top lid to the backpack frame. On our pack it is starting to come apart. The Forclaz Speed 50's profile is long and narrow. It is not as narrow as mountaineering summit bags, but it does allow the arms to swing freely when walking. 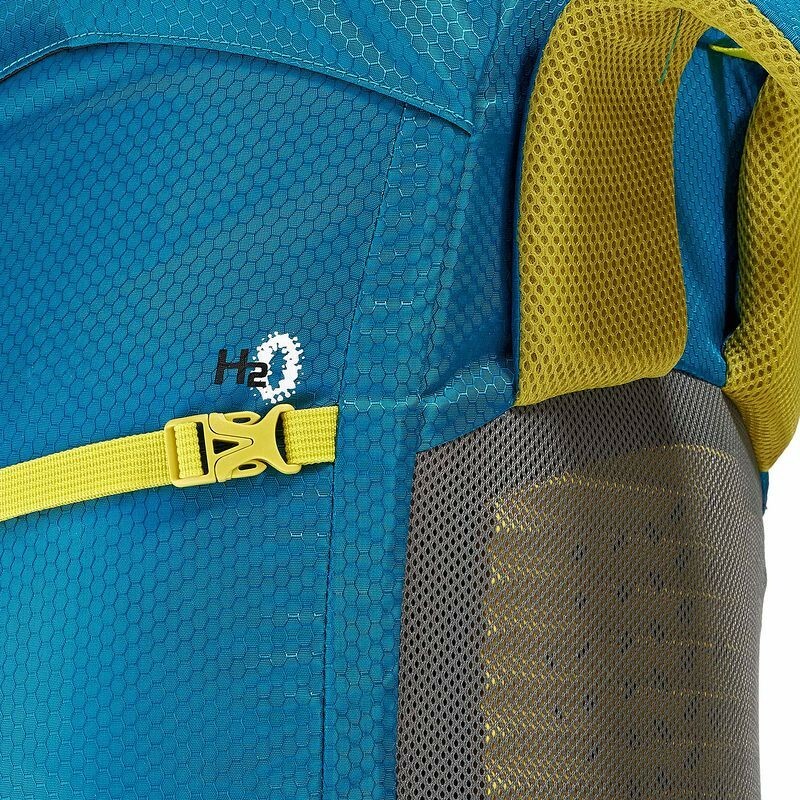 The pack comes with four horizontal compression straps, two on each side. These straps do their job and keep the bag cinched tight. Overall the bag feels compact and does not affect the centre of gravity. To keep the weight down, Decathlon has chosen the smallest possible snap buckles for the top lid, compression straps and the sternum strap. Doing and undoing these buckles with thick winter gloves is a chore and we often had to remove our gloves to clip or unclip these buckles. Since the design priority for this backpack is weight reduction as opposed to durability, we were a bit apprehensive on how this bag would hold up against the rigours of winter trekking. However, this backpack has put our doubts to rest and we are pleasantly surprised at how well this bag has held against branches, rocks, ice and snow. We do not pussyfoot around our equipment and after 7 months and over 30 treks of use later we have no rips, holes or zipper jams to report. Yet, not everything is perfect and our backpack does show some signs of wear. The seams that connect the top lid to the backpack have stretched and come apart in a few places. The backpack also has a few micro scrapes and frays on the front fabric, but nothing that is a cause for concern. The mesh fabric along the shoulders has frayed at contact points but has not yet completely come apart. Bag weight is a major yet oft overlooked component in overall pack weight. With the Quechua Forclaz 50 Speed, Decathlon has shown that a lightweight backpack can be both durable and comfortable. We hope that other Indian manufacturers sit up and take notice, and work on innovative solutions to reduce gear weight. As for the backpack itself, it is reasonably priced and offers great value. For the occasional trekker, we reckon this backpack will last around 3-5 years, barring a major mishap. While 700 grams of weight saving may not seem much, it is equivalent to the weight of a three season down sleeping bag or a one person single walled tent. 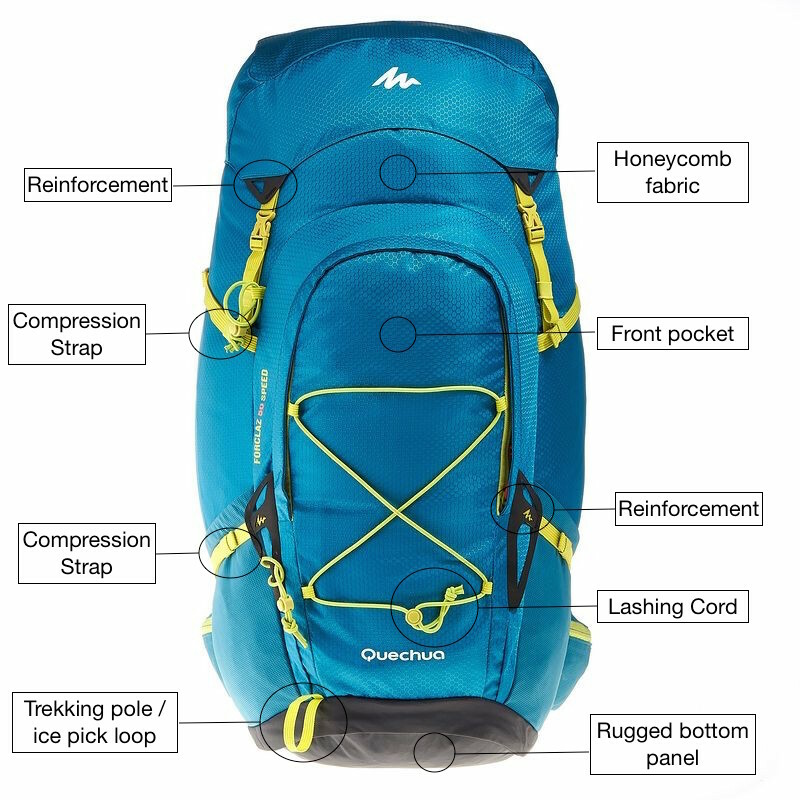 In conclusion, if your gear weighs under 15 kilos and you need a backpack for a multi-day trek; then Quechua's Forclaz Speed 50 is an almost perfect backpack. We award this backpack with four out of five stars and recommend it as an excellent product.